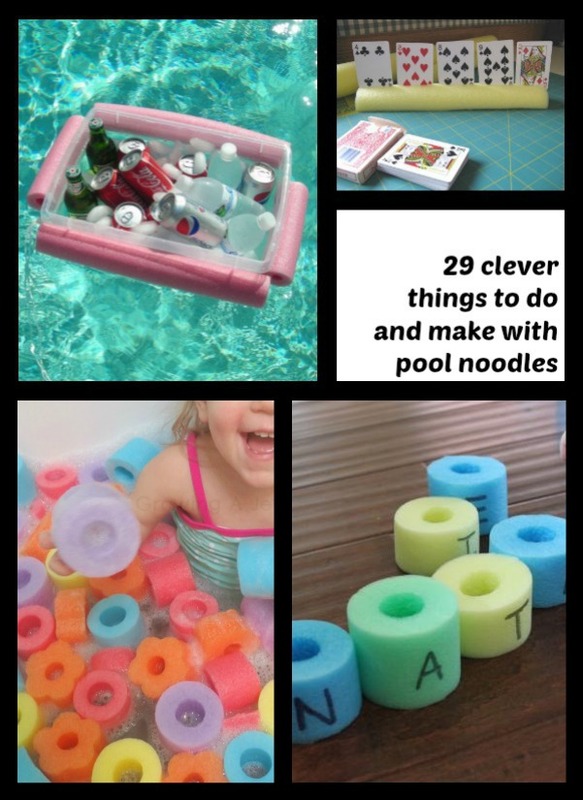 29 Pool Noodle Crafts - C.R.A.F.T. It’s pool noodle season, y’all! Pool noodles are officially for sale everywhere. That means it’s time to share all of the amazing things to do with a pool noodles from making a floating beverage boat to learning how to spell! 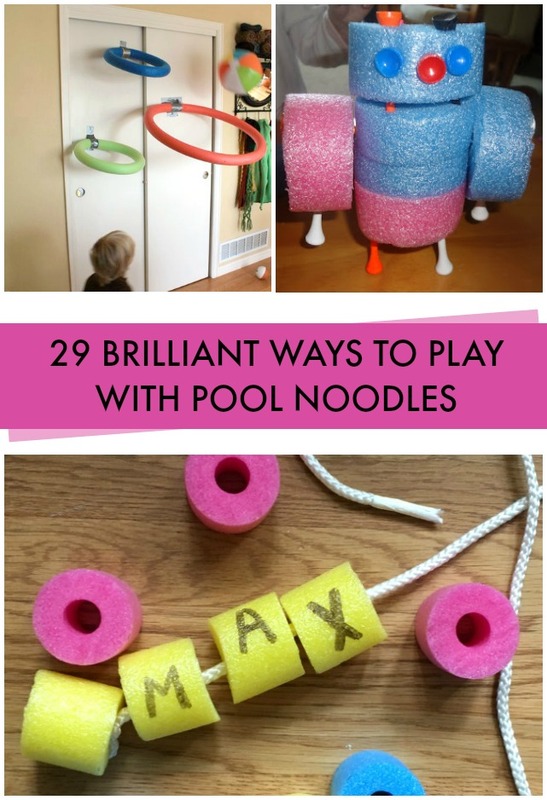 Here are 29 pool noodle crafts you and your kids will love. 1. 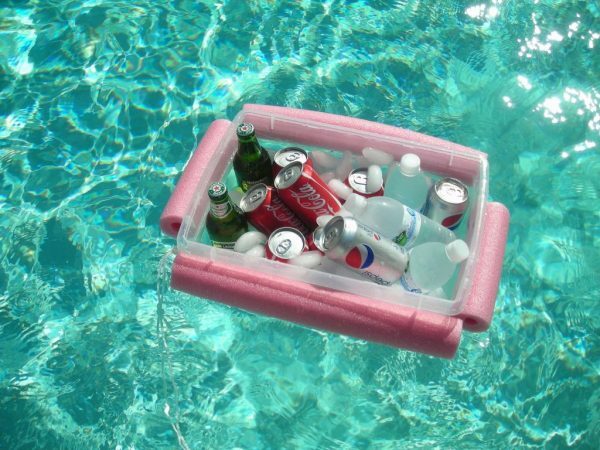 Make a floating beverage boat with a noodle and a plastic tub. This is genius if you ask me! See the full tutorial at Insturctables. 2. Love blocks, but hate the thunder when the towers crash? 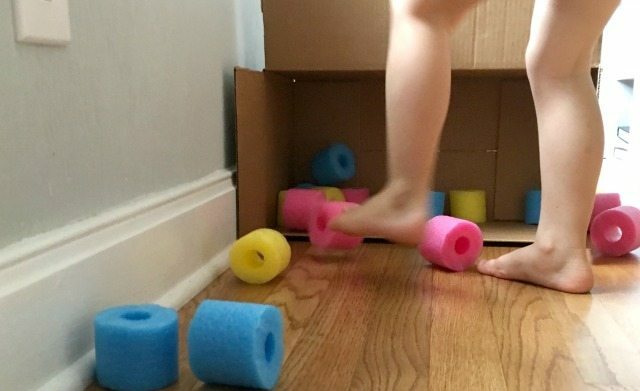 Pool noodle blocks are the perfect quiet time activity. See how to make pool noodle blocks at C.R.A.F.T. 3. 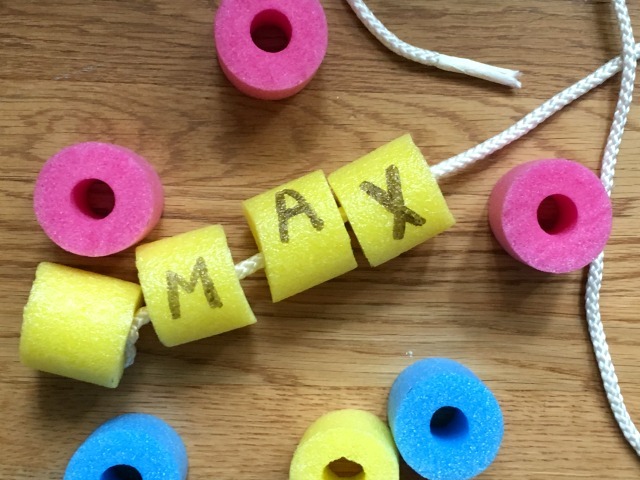 Use pool noodle blocks and a Sharpie to write letters and start learning to spell! Learn how to make pool noodle blocks at C.R.A.F.T. 4. Indoor soccer is a great activity to do when it’s crazy hot outside but still allows kids to get some energy out. Best of all, the quiet noodle blocks can’t break anything! 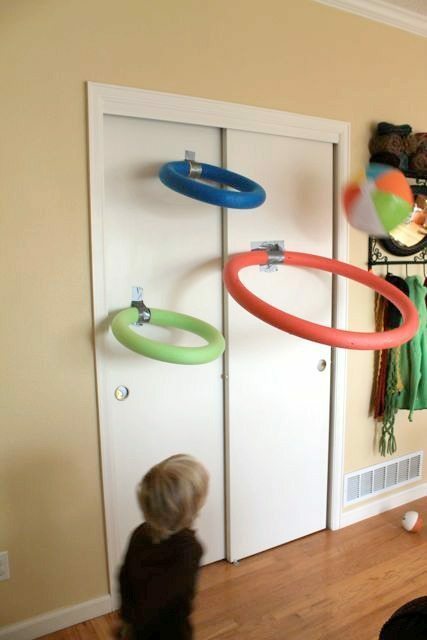 See more indoor sports ideas with pool noodles at C.R.A.F.T. 5. 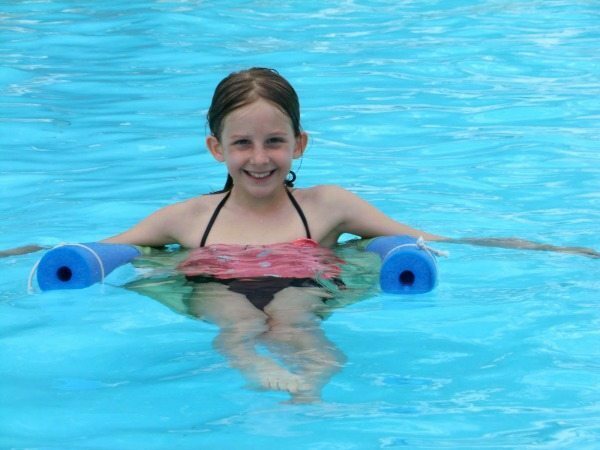 Use pool noodle blocks to play with in the bathtub or an outdoor pool! Learn how to make pool noodle blocks at C.R.A.F.T. 6. Use noodle blocks to string on a rope. Warning: Toddler will event lots of ways to use the giant necklace, including possibly lassoing his sister. 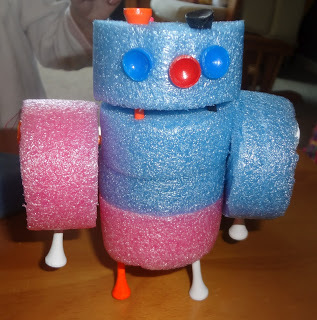 Learn how to make pool noodle blocks at C.R.A.F.T. 7. 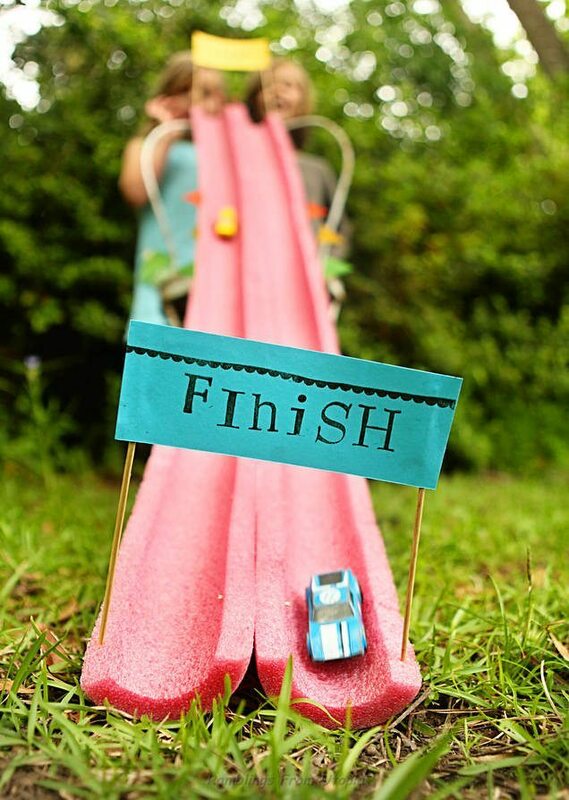 Slice a pool noodle length wise to make 2 perfect race tracks! For the complete tutorial check out Ramblings from Utopia. 8. Just in case you ever need a few faux logs: pool noodles + contact paper! See the full tutorial at Miss Kopy Kat. 9. Make yourself a fancy lake lounger with a simple noodle, fabric, and rope. A sewing machine will make this much easier, but it could be down by hand. 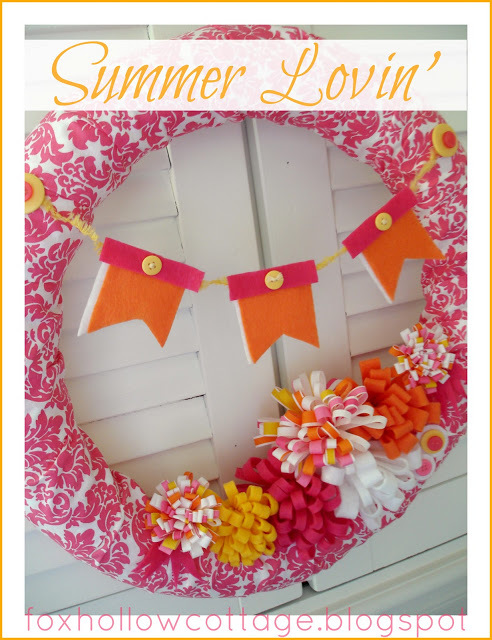 See the full tutorial at Country Chic Cottage. 10. This extra large number 2 pencil would be the perfect prop for back to school and end of school pictures with the kids. Bonus: It actually writes! See the dull tutorial at Crafty Biggers. 11. Pool noodles turned basket ball hoops for balls of all sizes. Beach ball basket ball is a great indoor game if it’s too hot or too cold to play outside. More indoor basketball details on Ever Never Again. 12. Jumbo Lincoln logs is genius, but finding brown pool noodles proves to be tricky. I suggest using the tutorial in #9 (above) for making faux logs, then use a kitchen knife and cut out notches in each log. This would be hours of building fun! 13. 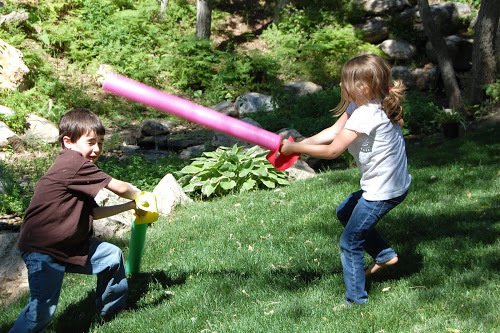 If the force is with you, turn a pool noodle into a light saber! Check out the full tutorial and light saber usage rules via Havoc and Mayhem. 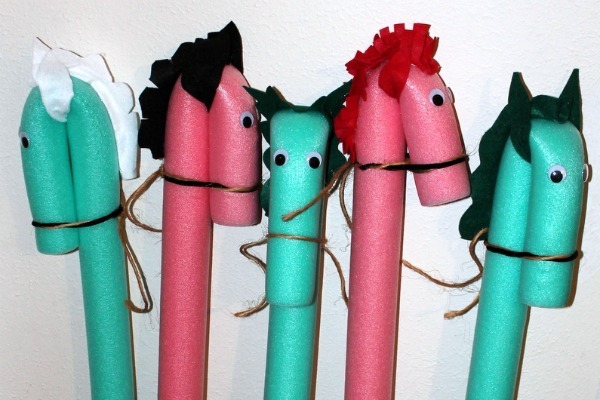 14. Who knew a little rope, a hot glue gun, felt, and google eyes could turn a plain ol’ pool noodle into a pony! See the complete pool noodle horse tutorial at Mrs. King’s Music Class. 15. 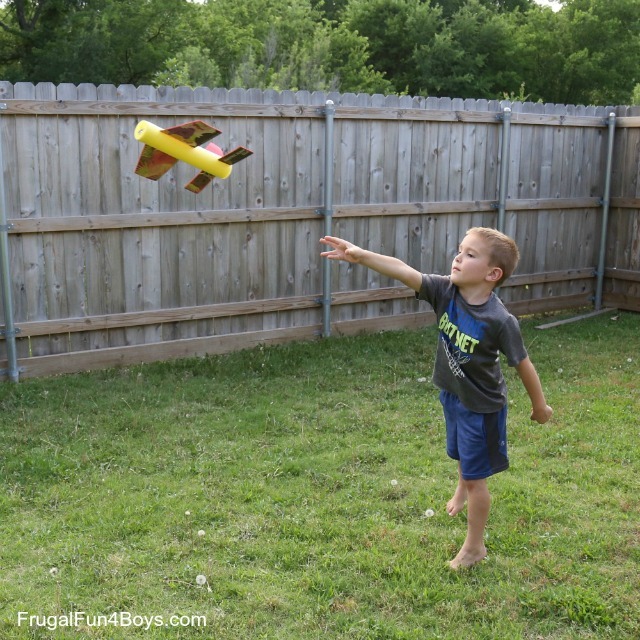 If you an airplane obsessed kiddo, you don’t want to miss these pool noodle turned airplanes from Frugal Fun 4 Boys. 16. As a canasta player, I can only imagine the greatness of a card holder. This is genius! See the complete tutorial at Adapting Creatively. 17. Stressed? You can make 58 1-inch stress relievers with a single pool noodle. See more details at the School Counselor Blog. 18. Hosting a campout, but fires aren’t allowed in your neck of the woods or classroom? 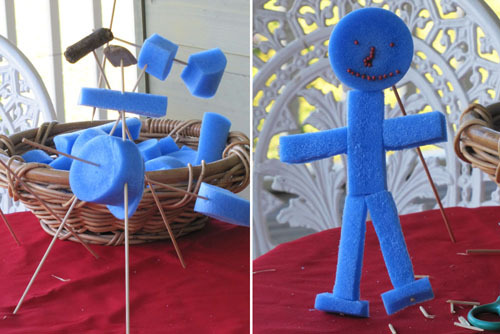 Make a pretend campfire with pool noodles. Details at Pre-K Pages. 19. Tuck a pool noodle under the fitted sheet on either side of the mattress and you just made bed rails to keep a kiddo from falling of the bed! See more details at Life Hacker. 20. What kiddo doesn’t love swords? 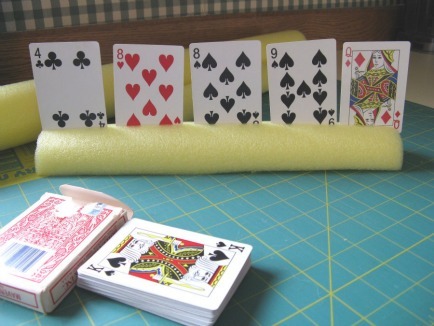 Craft up a a few soft swords with pool noodles at Or So She Says. 21. Who knew pool noodle blocks and toothpicks make awesome sculpture materials! Picture via Irresistible Ideas. 22. 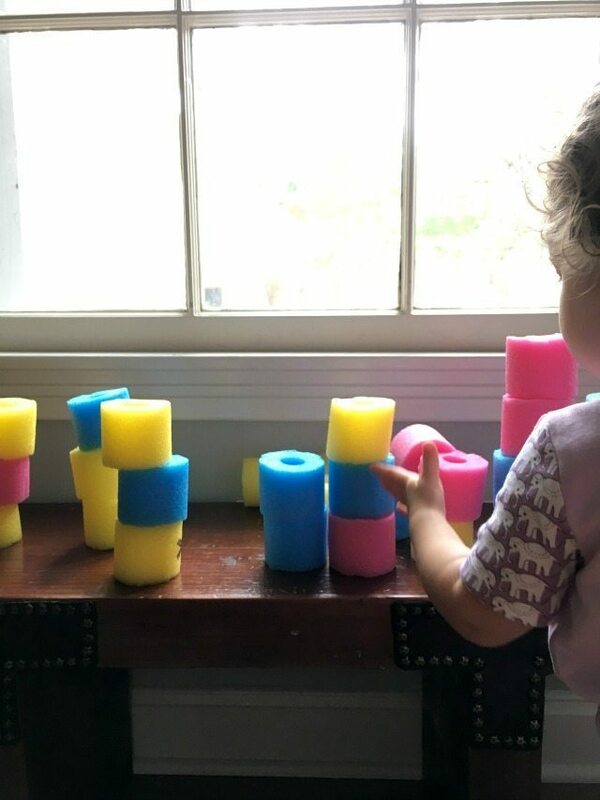 Ring toss is a fun backyard game, but have you ever thought of making an extra large ring toss with pool noodles, duck tape, and wooden dowels? See the full tutorial at The Joys of Boys. 23. It’s like Mr. Potato head but with pool noodle blocks and golf tees! See all the details at Time for Play. 24. You’ll never guess what you can do with a pool noodle and a little fabric? Make a wreath! For the full tutorial check out Fox Hollow Cottage. 25. 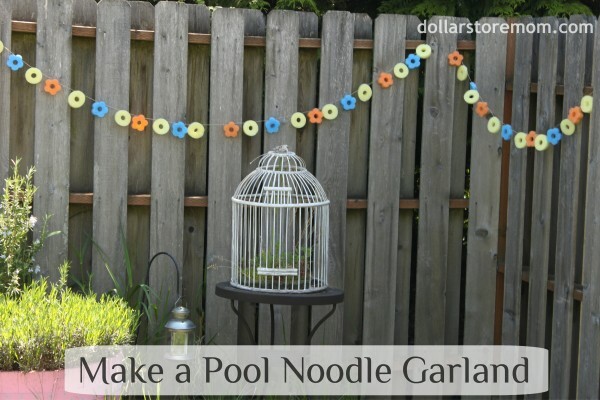 String pool noodle blocks together to make a cute (cheap) garland for the backyard. Full tutorial at Dollar Store Mom. 26. 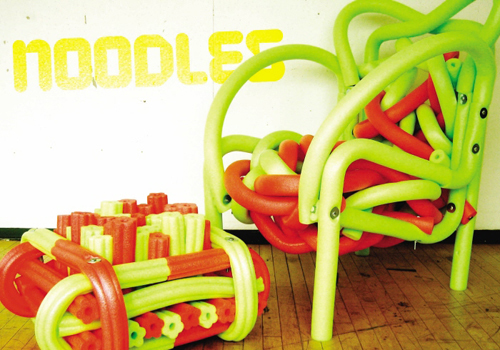 Pool noodles turned furniture… who knew! Give the kiddos some pool noodle building materials and encourage them to try and build a chair! More inspiration at Design-Milk. 27. Make chain links out of pool noodles. This could be a fun idea for learning to spell too. Details at Teach Preschool. 28. 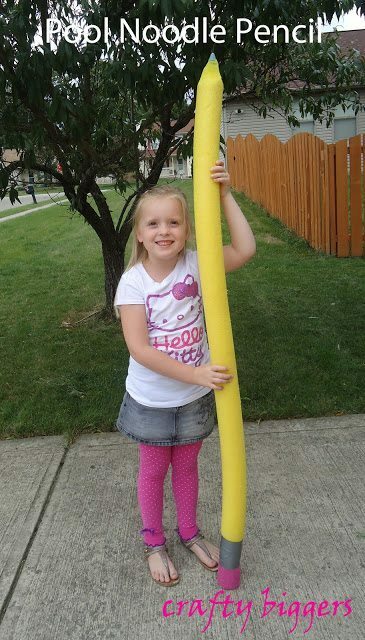 Just in case you need a giant paint brush know that you can make one with you guessed it… a pool noodle! See the tutorial at DIY Network. 29. These rocket flingers are fun to make and even more fun to fly. See the complete instructions at Frugal Fun for Boys and Girls. Make a slit down the center and put the noodles on the sides of your canoe to cushion it on the top of your car. One time we used the noodles to finish the edge of a table. Almost like a padded edge pool table. I love the Lincoln log noodle idea, somewhere I read they were purchased at the dollar store, I would love to find out more, I have never seen them at the dollar store and have never seen them in the brown color. Great ideas! 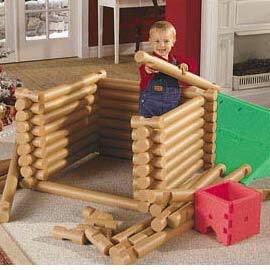 I have tried to get to the directions for making the Lincoln logs with not success. It takes me to a storage solution site. What am I doing wrong? I use noodles as inserts in my boots. I use a section on my kitchen sink hose sprayer to stop from getting soaked. I’m loving all these ideas but most especially the basketball hoops. I never knew there were so many things you could do with a pool noodle! What is the best tool to cut the noodles? Exacto? Bench saw ;)? Can you give me the measurements for the pool noodles. I know you cut them in half, but what were the size of the smaller ones? Good idea on pool noodles! I have 2 grandkids 1 and 2 sister and brother..I’m on a limited budget …..I hope they still sell them in oct. for xmas gifts th o make!